Zak, Aaron, Nick and Billy are coming back for more ghostly encounters and lock down action when the Travel Channel series Ghost Adventures kicks off its Eighth Season, and celebrates its 100th episode, this August. Beginning Aug. 16 at 9 p.m., the season of 13 one-hour episodes features not only some amazing locations but also its milestone 100th-episode. Additionally, we'll see a one-hour special showcasing the 100 most memorable moments from the show's history. 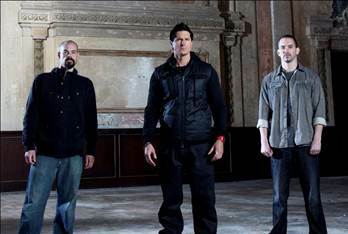 Ghost Adventures: Up Close & Personal, will premiere on Friday, Sept. 27 at 9 p.m. ET/PT. The episode will include 10 different categories and clips chosen by fans and the Ghost Adventures team of Zak Bagans, Aaron Goodwin and Nick Groff. Categories include; funniest, scariest, riskiest, most disturbing locations and best star cameos. Then, the milestone 100th episode premieres on Friday, Oct. 4 at 9:00 p.m. ET/PT but the location is soon to be announced. We know the crew has head to Florence, Italy, but no word on whether that will be the site of the ep. The saloon is full of mysterious paranormal activity, ranging from full body apparitions to disembodied voices and plumes of cigarette smoke manifesting out of thin air. As the team digs deeper in the location’s history, they discover that not only is it situated near the site of a 1942 plane crash in which actress and wife of Clark Gable – Carole Lombard – was killed. It’s also where notorious card cheat Paul Coski was brutally murdered during his final card game. As the trio works to solve the mystery behind this den of doom, they capture startling evidence during their frightening lockdown. Other lockdown locations this season include the 150-year-old Black Swan Inn in San Antonio, TX; the Tuolumne General Hospital in the old mining town of Sonora, CA; the notoriously violent Missouri State Penitentiary in Jefferson City, MO; the Yost Theater and Ritz Hotel in Santa Ana, CA; and, a haunted century-old Victorian Mansion just outside of Boston. According to lead investigator and one of the show’s executive producers, Zak Bagans, "each investigation we do is personal." "We are on the front lines, often with malevolent spirits, working to uncover the truths behind the paranormal and understand the secrets those who have gone before us hold," he said "Each lockdown is rife with challenges, both physically and mentally, but we accept them; we’ve dedicated our lives to understanding, educating and discovering a world that is perhaps one of the greatest mysteries of all time." Also, check out Zak Bagans, Aaron Goodwin and Nick Groff on Travel Channel's new “Host’s Hometown” Web series, which begins today. The series explores the hometowns of the Ghost Adventures paranormal investigation team, and is hosted by the trio themselves. The first webisode will feature Nick Groff’s home city, while Aaron Goodwin’s and Zak Bagans’ hometowns will be featured over the next few months.